Getting ready for an emergency is about 90% mental and 10% having stuff. But, after we have learned about the possible emergencies we could face and how we can respond to them, we need to get our PHYSICAL preparations in order. We don’t stop learning, but now we at least have a basic knowledge of what we need, when and where we need it and how to use it. Start gathering your emergency supplies. Much of your basic emergency supplies may already be found in your home. 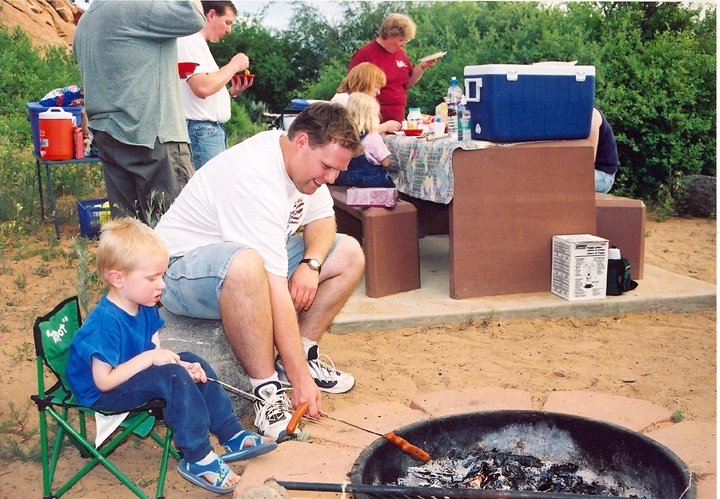 From camping gear, cooking utensils, pantry stores and that pile of stuff in the garage that you need to go through. It is important to get these things organized and even listed so you know where they are and if they even still work. Let’s start by talking about WHERE you will need emergency supplies. The answer is anywhere you may be when confronted by an emergency. How much of your time do you spend at home? At work? At school? In the car? Any place you spend time you should have emergency supplies. The kind of supplies and the amount will depend on your storage space and needs for the area. Car emergency kits are different than your work emergency kit or your home emergency supplies. For a list of items for different kits, see the PAGES link at the left. The first item to prepare is your 72 Hour Kit. Whether you are evacuating or sheltering in your home, a 72 hour kit is three full days worth of everything you need to survive. Make sure THIS kit is complete before working on the others. Kits need to be individually portable. Each person needs to be able to carry or transport their own kit whether it’s a backpack, duffle bag, bucket or wheeled suitcase. You need to cover all TEN AREAS OF EMERGENCY PRPAREDNESS, (SEE Self Reliance) but only the basics. It needs to be light enough for children or physically impaired people to be able to carry or roll on their own. Limit the size of your kit to the same as a piece of carry-on luggage. Depending on the situation, if your kit is too big it may be left behind to allow another person on the evacuation vehicle. It needs to be small enough to fit on your lap. Store the kit for easy, quick access. If your 72 hour kit is the one thing you grab as you’re running out the door, other than your family, it can’t be down in the basement, hiding behind the Christmas decorations. It needs to be near an exit. A closet near front door is ideal. Finally, update the contents of your kit every 6 months. Go through the inventory list and make sure everything is still there and still functioning. Rotate your food, water, batteries and medicines. Make sure clothing still fits. Update important documents. 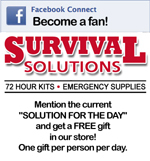 After your 72 hour kits are in order, work on your food and water storage. Start with two weeks of water and one month of food. Build up to a month of water and three months of food. Always remember to “Eat what you store and store what you eat” so your food supplies are not wasted. When storing anything from food and water to batteries and medications, remember to always keep it cool, dark & dry. This prolongs shelf life for as long as possible. In all of your emergency kits you will need copies of your important information. This includes identifications, insurance policies, emergency contact information, current family photos, diplomas and other certificates, birth certificates, wedding licenses, legal documents, account information, etc. It’s also a good idea to have cash in small bills for when the ATMs and credit card readers don’t work. Store fuel. Gasoline for the car and generator, wood for the fire place, propane for the stove and heaters. Keep different kinds of fuel, don’t rely on just one. Find out local laws on how much, where and how to store fuel. Also remember your family’s sanitation needs. Put together a portable sanitation kit and include a privacy shelter. Have a safe way of disposing of garbage and biological waste. Also have a means for washing people, clothes and dishes. 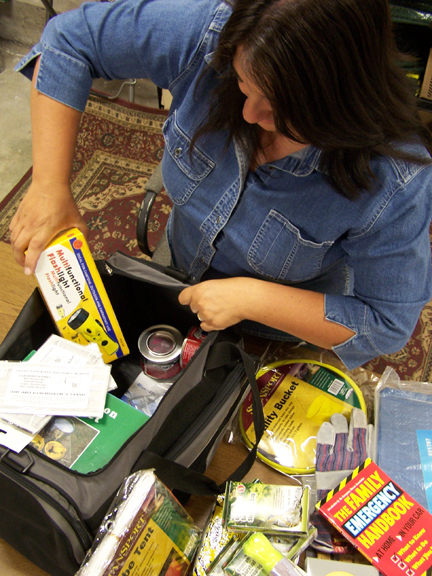 Build your car and work emergency kits and STORE THEM WHERE THEY BELONG. Auto survival kits won’t do you any good if they are left in the garage; work survival kits won’t save your life or the life of a coworker if left at home. It sounds like a lot of work, but do a piece at a time and make emergency preparedness a priority. If you do, you won’t be part of the problem, you will be part of the solution.